The Future of Urban Food – Engage! Urban agriculture could yield up to 10 percent of many food crops. Gotham Greens’ boxed lettuces have been popping up on the shelves of high-end grocers in New York and the Upper Midwest since 2009, and with names like “Windy City Crunch,” “Queens Crisp,” and “Blooming Brooklyn Iceberg,” it’s clear the company is selling a story as much as it is selling salad. Some forms of urban farming may be more energy-intensive than rural agriculture, especially indoor vertical farms that rely on artificial lighting and climate control. An operation like Gotham Greens can recycle water through its hydroponic system, but outdoor farms such as the ones sprouting on vacant lots in Detroit usually require irrigation, a potential problem when many municipal water systems are struggling to keep up with demand. And many urban farms struggle financially; in a 2016 survey of urban farmers in the US, only one in three said they made a living from the farm. Although cities and states have begun to loosen restrictions on urban agriculture, and even to encourage it with financial incentives, it has remained an open question whether growing food in cities is ultimately going to make them greener. Will the amount of food produced be worth the tradeoffs? A recent analysis of urban agriculture’s global potential, published in the journal Earth’s Future, has taken a big step toward an answer—and the news looks good for urban farming. “Not only could urban agriculture account for several percent of global food production, but there are added co-benefits beyond that, and beyond the social impacts,” said Matei Georgescu, a professor of geographical sciences and urban planning at Arizona State University and a co-author of the study, along with other researchers at Arizona State, Google, China’s Tsinghua University, the University of California, Berkeley, and the University of Hawaii. A MODIS Land Cover Type satellite image of the United States, similar to imagery analyzed by the researchers. 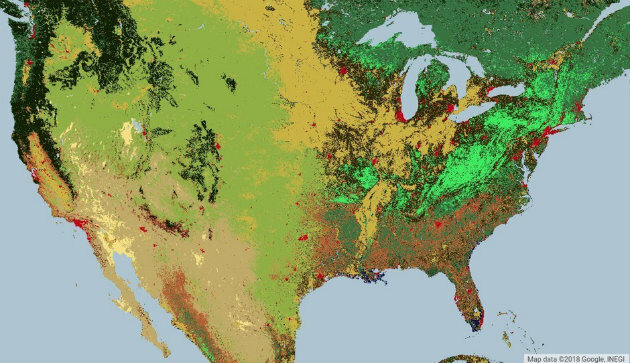 Different colors indicate different land uses: red is urban; bright green is deciduous broadleaf forest. Using Google’s Earth Engine software, as well as population, meteorological, and other datasets, the researchers determined that, if fully implemented in cities around the world, urban agriculture could produce as much as 180 million metric tons of food a year—perhaps 10 percent of the global output of legumes, roots and tubers, and vegetable crops. Those numbers are big. Researchers hope they encourage other scientists, as well as urban planners and local leaders, to begin to take urban agriculture more seriously as a potential force for sustainability. The study also looks at “ecosystem services” associated with urban agriculture, including reduction of the urban heat-island effect, avoided stormwater runoff, nitrogen fixation, pest control, and energy savings. Taken together, these additional benefits make urban agriculture worth as much as $160 billion annually around the globe. The concept of ecosystem services has been around for decades, but it is growing in popularity as a way to account, in economic terms, for the benefits that humans gain from healthy ecosystems. Georgescu and his collaborators decided to investigate the potential ecosystem services that could be provided through widespread adoption of urban agriculture, something that had not been attempted before. The team began with satellite imagery, using pre-existing analyses to determine which pixels in the images were likely to represent vegetation and urban infrastructure. Looking at existing vegetation in cities (it can be difficult to determine, from satellite imagery, what’s a park and what’s a farm), as well as suitable roofs, vacant land, and potential locations for vertical farms, they created a system for analyzing the benefits of so-called “natural capital”—here, that means soil and plants—on a global and country-wide scale. Beyond the benefits we already enjoy from having street trees and parks in our cities, the researchers estimated that fully-realized urban agriculture could provide as much as 15 billion kilowatt hours of annual energy savings worldwide—equivalent to nearly half the power generated by solar panels in the U.S. It could also sequester up to 170,000 tons of nitrogen and prevent as much as 57 billion cubic meters of stormwater runoff, a major source of pollution in rivers and streams. “This is the first global estimate of the potential for urban agriculture,” Costanza wrote in an email. “Urban agriculture will never feed the world, and this paper confirms that, but the important point is that natural capital in cities can be vastly improved and this would produce a range of benefits, not just food.”Costanza said he would like to see the researchers’ big data approach become standard in urban planning, as a way to determine the best balance between urban infrastructure and green space—whether it’s farms, forests, parks, or wetlands. That is the researchers’ hope as well, and they’ve released their code to allow other scientists and urban planners to run their own data, especially at the local level. Meanwhile, policy in the U.S. and internationally is already changing to accommodate and encourage urban agriculture. California, for example, passed its Urban Agriculture Incentive Zones Act in 2014, allowing landowners who place urban plots into agricultural use to score valuable tax breaks. The idea has proven controversial—especially in housing-starved San Francisco. Beyond raising rents, critics have argued that urban agriculture, if it impedes development of housing, could reduce density, contributing to the sort of sprawl that compels people to drive their cars more. Put urban farms in the wrong place, and an effort to reduce food’s carbon footprint could have the opposite effect. On the other hand, businesses like Gotham Greens that aim to expand may still be hampered by zoning—Puri and his co-founders had to work with New York’s zoning authority to change regulations affecting greenhouses before they could open their first farm. As the company looks to add sites in other cities, the wide array of their zoning rules, utility access, and regulations will influence its decisions. While more data about the potential ecosystem services and tradeoffs would surely help create a more navigable regulatory landscape, Puri, like others in his industry, is also something of an evangelist, eager to put in a word for urban farming’s less quantifiable benefits.